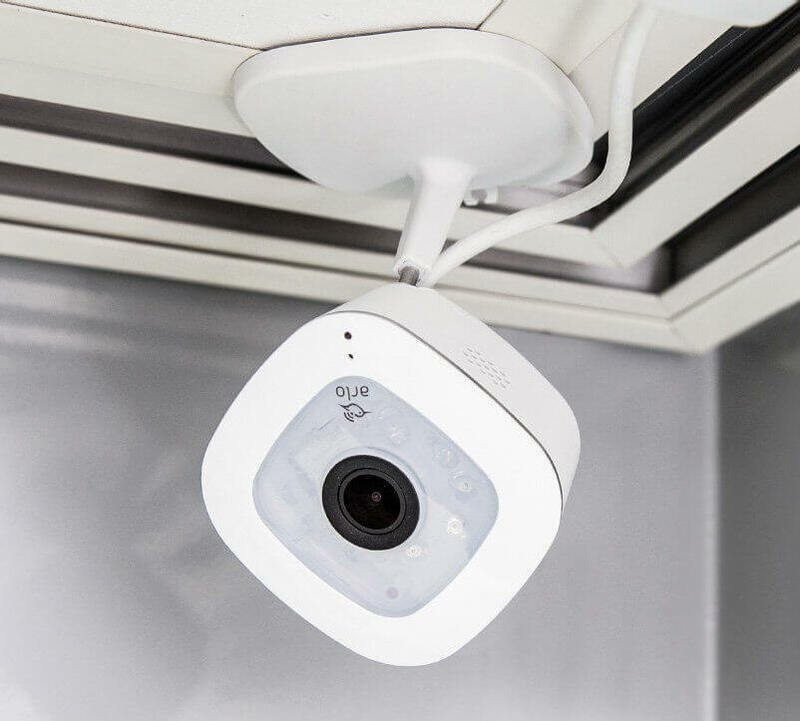 All Arlo security cameras are great for monitoring your home without paying monthly fees since they come with 7 days of free cloud storage. But what’s the difference between the original Arlo and the new Arlo Pro? 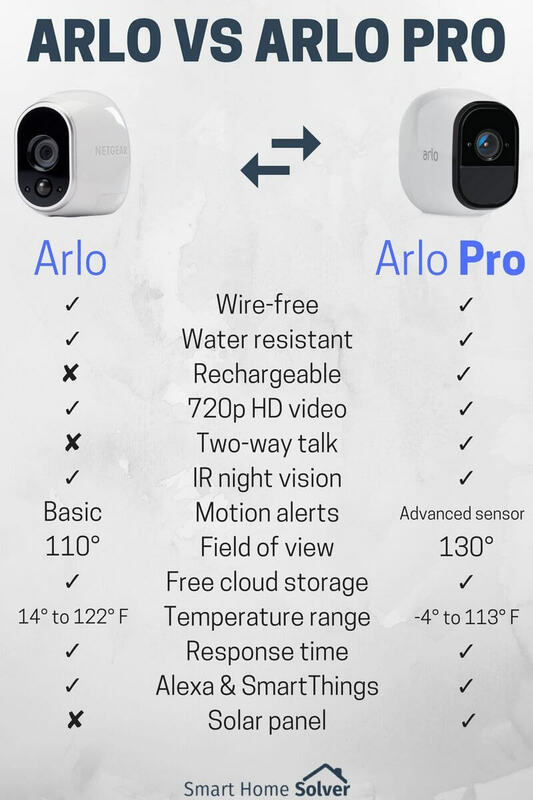 Read on for more details comparing Arlo and Arlo Pro camera’s pros and cons. 1.4 Should I upgrade my current Arlo cameras? The original Arlo (also called Arlo Wire-Free) was released a few years ago as a weatherproof, wireless home security solution. Since it worked on batteries, you could easily use it inside or out without difficult setup. While it was definitely groundbreaking as the first Arlo camera, there were a few areas where it fell short. Its batteries were not rechargeable, and it lacked two-way talk. This is why Arlo Pro was released a few years later. Let’s go over the key similarities in both cameras before hashing out the Arlo and Arlo Pro differences. Arlo and Arlo Pro both have a few similarities in both their hardware and software. Water-resistant and weatherproof for outdoor use. Arlo Pro works at colder temperatures, but both cameras are suitable for outdoors. 720p video quality. If you want 1080p, check out the updated Arlo Pro 2. Infrared night vision gives you a clear image even when the sun goes down. Both are backwards and forwards compatible. Whether you have the original or updated Arlo base station, both cameras will work with either base station and your other Arlo cameras as well. Easy installation. Charge up the Arlo Pro camera or insert batteries into Arlo Wire-Free. Then you can quickly install the cameras using the included mount or another specialty mount. These cameras are both wire-free, so no drilling is required. You don’t even have to install them near an outlet since they work on battery power. Same Arlo app to set motion alerts and adjust sensitivity. App available on iOS, Android, or the web. 7 days of free cloud storage for up to 5 security cameras. This is way more generous than its competitors and means you can basically use Arlo cameras without any paid plan. If you want additional storage, a paid plan is available as well. Easily arm or disarm using the app. You can establish specific modes within the app. Each mode arms different cameras, and triggers them to sound your siren, send a push notification, and/or record. Customize your modes one time, and then you can quickly change modes whenever you need to arm or disarm your system. Download videos for free within the app. Arlo Smart upgraded plan is available on either camera. This adds functionality for the cameras to notice the difference between people, animals, vehicles, and others. It costs $3.99 per camera per month. Same smart home compatibility, including SmartThings integration, IFTTT, Alexa, Echo Show, Wink, and more. While some of the Arlo Pro upgrades improved on specific issues in Arlo Wire-Free, others are extra benefits. We categorize the different upgrades below in our Arlo and Arlo Pro comparison. Arlo Pro comes in camera kits with up to 4 cameras and a base station. The new base station that comes with the Arlo Pro camera kit is improved with updated functionality over the original. Rechargeable batteries with fast charging. 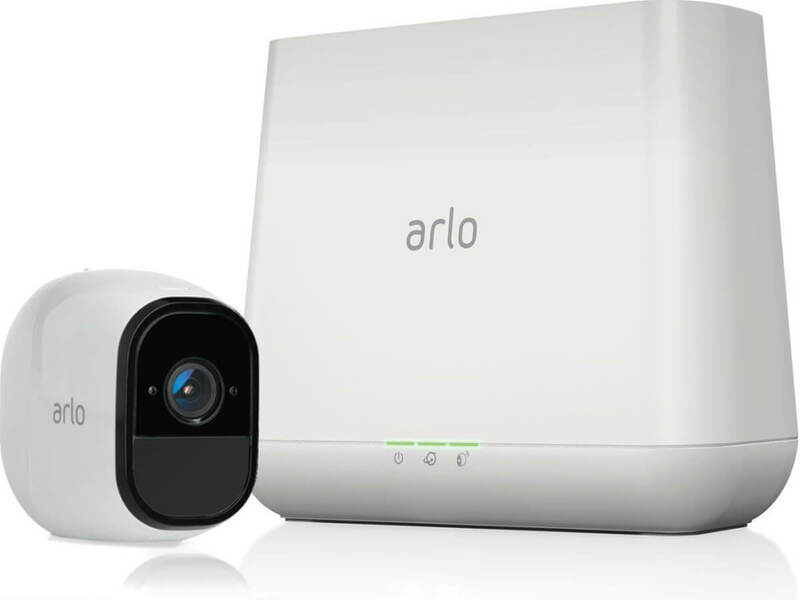 This is the biggest difference comparing Arlo and Arlo Pro. Instead of the extra cost and effort replacing batteries every four months, you can simply recharge your Arlo Pro batteries by plugging in the camera. Arlo says its Arlo Pro batteries can last 6 months or longer, depending on the use. I’ve found that this claim is accurate, and my Arlo Pro batteries last at least 6 months when used moderately. Read our full Arlo battery life review for more details. Two-way audio with a speaker and microphone. This is essential for outdoor cameras since they are typically used to speak with guests at the front door, or intruders at the back. Advanced motion detection using a PIR motion sensor. This sensor allows your Arlo Pro to essentially go into “sleep” mode until it is awoken by motion, saving your battery. This also translates to longer battery life compared to Arlo Wire-Free. Improved lag time. From the time someone walks in front of your camera until you get a notification is only 2 or 3 seconds of delay. The original Arlo Wire-Free’s response time varied, but at times it was more like 8 or 9 seconds (check out this thread for a video comparison from both cameras). For an even quicker response time, you’ll want to look at Arlo Pro 2, which offers a 3 second look back so you don’t miss a thing. Works at colder temperatures, down to -4° Fahrenheit compared to the traditional Arlo, which can only work down to 14°. This could be a deal breaker if you live in a cold area. Wider field of view: 130 degrees instead of just 110. This makes all of the difference in improved surveillance and receiving notifications quicker. Plug is included. This is useful if you would rather plug in the camera instead of depending on batteries. The batteries charge up quickly, but you can also plug in the cameras while they are charging if you don’t want to have no camera installed during that time. Arlo also sells a battery charging station. Of course, the other option is to leave Arlo Pro plugged in at all times so you don’t have to hassle with batteries at all. Solar panel (sold separately) uses the sun’s energy to power the Arlo Pro, so you never need to recharge the batteries again. You can easily mount it near your Arlo Pro cameras to keep them continuously charged. Note that this panel has mixed reviews on Amazon, so you will want to really research before purchasing. Cleaner look. While they appear very similar, if you look a little harder you can see that Arlo Pro has a cleaner face on the front of the camera. It’s minor, but still less likely to stand out if you’re trying to hide your security camera. The new base station has a 100-db siren that sounds when there is motion or if you manually ring it within the app. 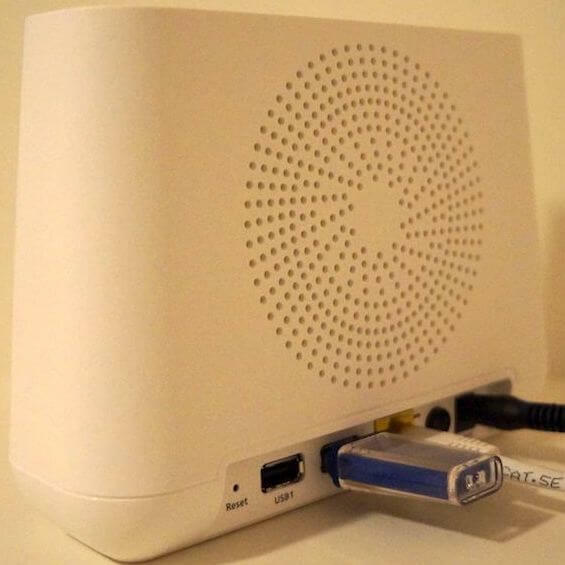 New base station also offers local backup storage via a connected USB drive. This is a great back-up if the Internet is down and you need to store footage. This is the only local storage offering on Arlo cameras, since none of them have local storage on the cameras themselves. As you can tell there are quite a few Arlo and Arlo Pro differences worth noting. If you’re still unconvinced at why Arlo Pro is better, take a look at the Arlo Pro in action and view samples of footage in our hands-on Arlo Pro review. Many customers were frustrated with some of the issues of the Arlo Wire-Free. The biggest problems were no two-way talk and a lag between when the camera senses motion and your phone is notified. The other big issue was non-rechargeable batteries that need replacing every 4 months. If you have Arlo Wire-Free, one workaround is that you can buy rechargeable batteries separately manufactured by Tenergy that have decent Amazon reviews. This serves as more of a retrofit solution rather than a great option. 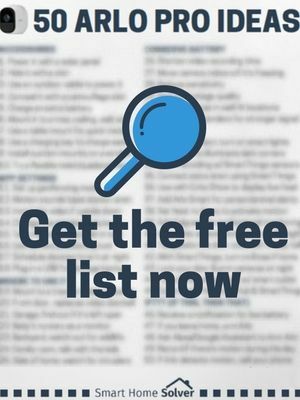 All of these issues and more are solved with Arlo Pro. Sometimes manufacturers release a “Pro” version with very few additional features and it’s not worth buying the newer model, but this is not one of those times. 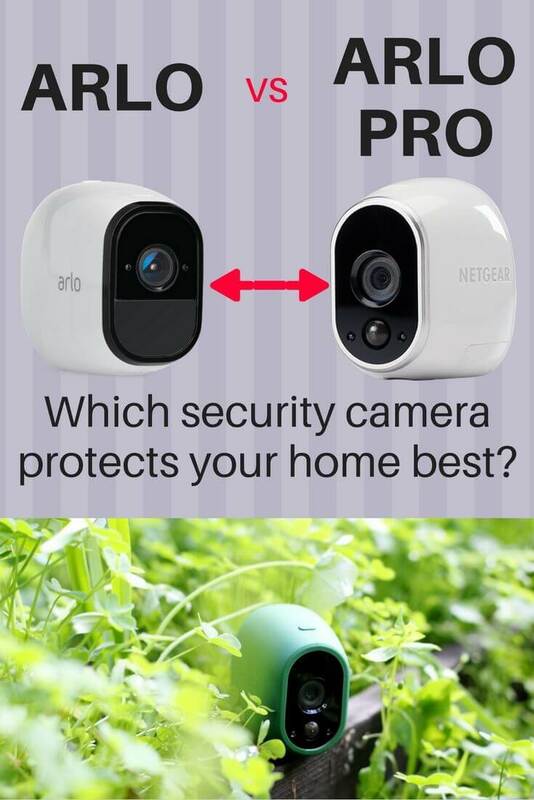 There is a noticeable difference between Arlo and Arlo Pro. I highly recommend Arlo Pro over the Arlo Wire-Free. While Arlo Wire-Free is a little cheaper, paying a little more for the Arlo Pro gets you many more features and better functionality. Your home will also be more secure since motion alerts will come in faster. Arlo Wire-Free has plenty of issues, and comparing Arlo and Arlo Pro makes it difficult to find much wrong with the Arlo Pro. 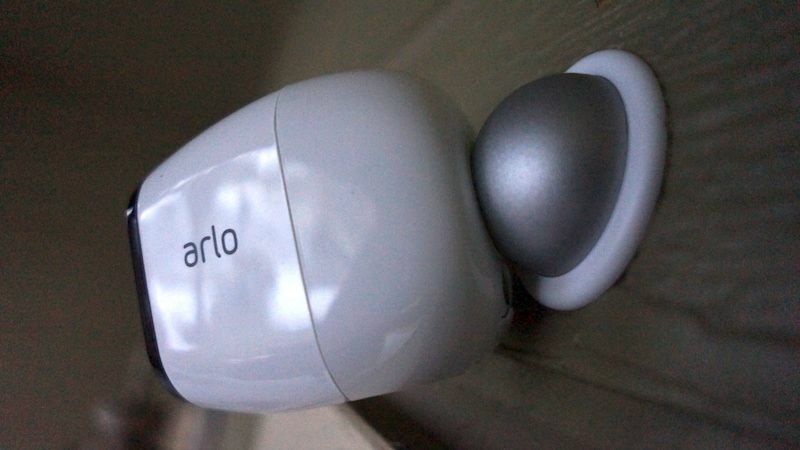 Read our full Arlo Pro review for how it worked at my house. Should I upgrade my current Arlo cameras? If you already own Arlo Wire-Free, you might be comparing Arlo vs Arlo Pro because you want to add in a few Arlo Pro cameras to see how they work for you. 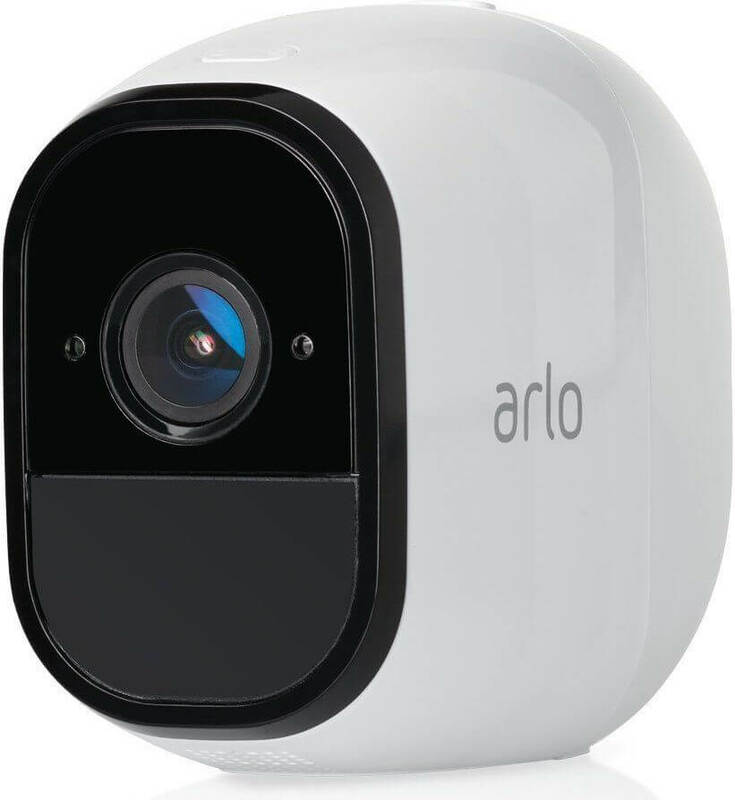 Arlo Pro’s added features make it an excellent camera for upgrading your front porch or family room, where you can talk back and forth with your kids or guests. The good news is that the Arlo Wire-Free cameras are still fully supported and sold as an option for your home; it’s not as if they are old technology. If you have the Wire-Free cameras, you don’t need to throw them out. They work with the new base station and Arlo Pro cameras seamlessly. If you are interested in adding some of the Arlo Pro features to your home, buy an Arlo Pro add-on camera that will work with your existing base station. If you want to upgrade to the new base station, you will need to buy at least a 1 camera kit, which includes a camera and base station. The other updated option is Arlo Pro 2, which has 1080p footage, Continuous Video Recording, motion zones, and more. These extra features come at a higher price tag, but may be worth it if you want clear footage for easily identifying faces. The Arlo Pro 2’s continuous video recording and 3-second look back also help make sure you aren’t missing any footage since it triggers recording earlier. We tested Arlo Pro and Arlo Pro 2 next to each other to find even more differences and upgrades. Several features are only offered if the camera is plugged into power, so you’ll want to see our full comparison of Arlo Pro vs Arlo Pro 2 to find the right fit for your home. If you’re not a fan of Arlo, we also like Canary Flex and Nest Cam for outdoor use. 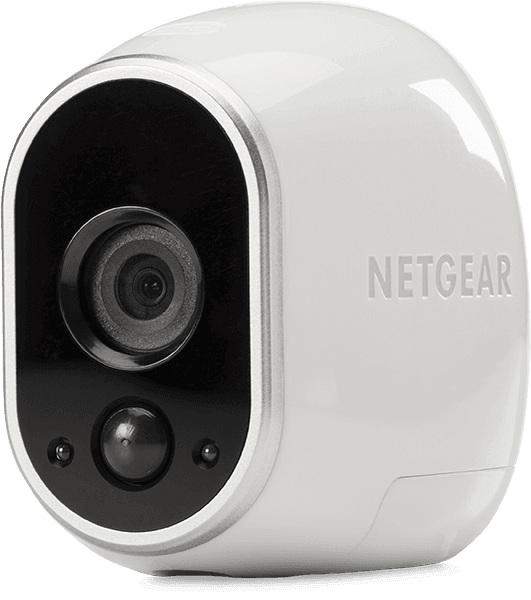 Our outdoor camera comparison and wireless security camera comparison are filled with cameras from all types of manufacturers, with prices and Amazon reviews easy to quickly review. Arlo Go has 3G and is designed for areas without WiFi coverage. Arlo Pro 2: As mentioned above, this has a few upgrades like 3 second look back, continuous recording (for a monthly fee), and 1080p footage. 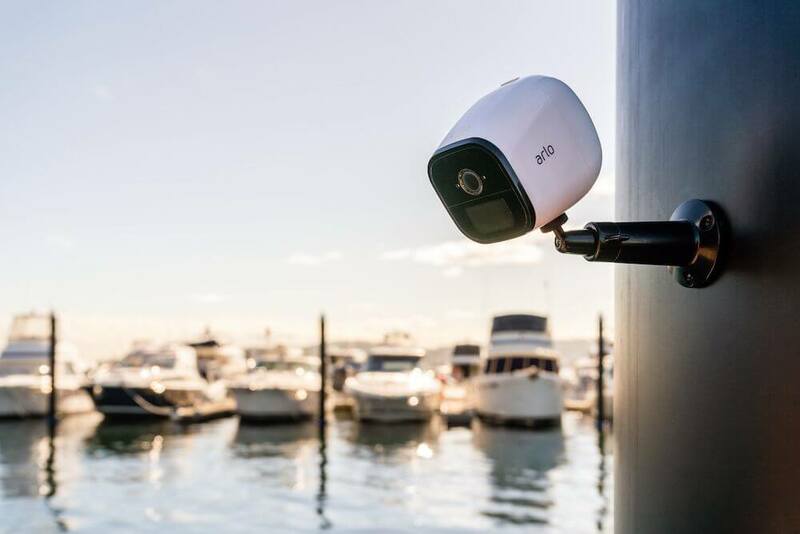 Arlo Go: This is similar to Arlo Pro, but it has the upgrade of 3G/4G LTE coverage for areas without internet. For this reason, Arlo Go is more expensive and bulky. 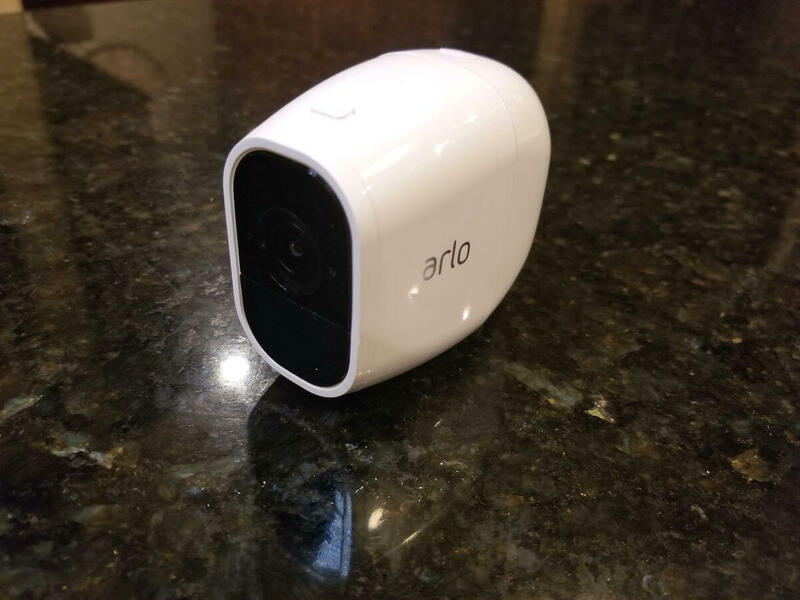 Arlo Q: Arlo Q has AC powered and designed for indoors. Arlo Q also offers Continuous Video Recording, if you are willing to pay a small monthly fee. This camera is more affordable than the others since it doesn’t offer battery power or weatherproofing. When comparing Arlo and Arlo Pro, it’s clear that the winner is Arlo Pro, as long as you’re willing to spend a little more. The Arlo Pro cameras offer huge upgrades at a price that is only slightly higher. Our Arlo Pro cameras have been securing our home for years without any major flaws. We’ve recorded dropped packages, people looking through our windows, a spider building a web, police officers at our front door while we were out of town, and way more. Arlo Pro has been very reliable and its quick response times are impressive. Do you have anything we missed comparing these Arlo cameras? Let us know in the comments!